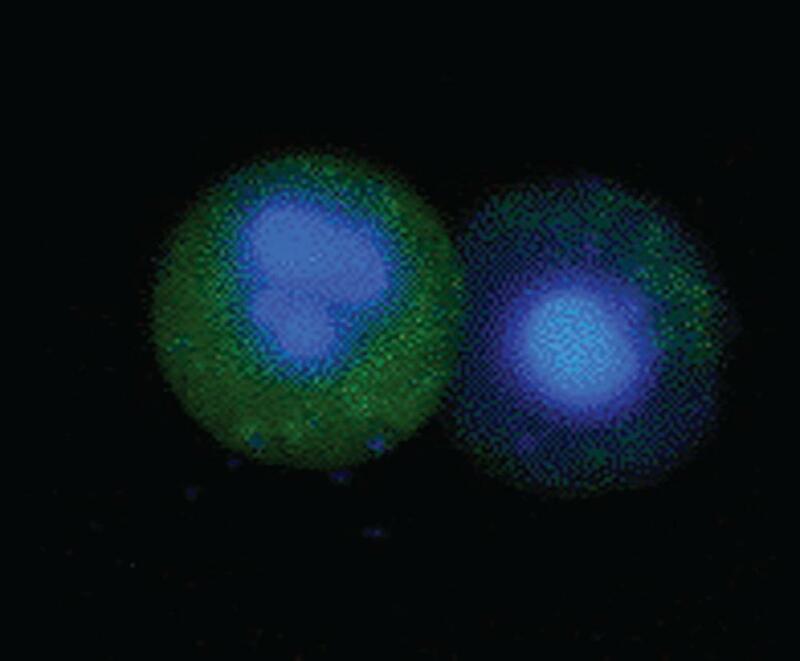 Jurkat cells were treated as shown with staurosporine at 1 μM to induce apoptosis. The cells were then stained with FAM FLICA Poly Caspase Kit (ICT091) and ReadiDrop™ Propidium Iodide (1351101). Apoptotic cells positive for caspases can be seen in the bottom right quadrant and dead cells positive for both caspase and propidium iodide in the top right quadrant. Healthy cells are negative for both stains. Data acquired on the ZE5™ Cell Analyzer. The FAM FLICA™ Poly Caspase kit uses a quick and easy method to analyze active caspases in apoptotic cells. This FLICA™ reagent binds the following activated caspases: Caspase 1, Caspase 3, Caspase 4, Caspase 5, Caspase 6, Caspase 7, Caspase 8 and Caspase 9. It can also be used as a generic probe for the detection of most caspases. Please see PDF datasheet for full Health & Safety information. Chua, M.L. et al. (2014) DNA double-strand break repair and induction of apoptosis in ex vivo irradiated blood lymphocytes in relation to late normal tissue reactions following breast radiotherapy. Radiat Environ Biophys. 53 (2): 355-64.